Abstract: Objective To investigate the protective effect and underlying mechanism of the superoxide dismutase mimic, manganese (Ⅲ) tetrakis (1-methyl-4-pyridyl) porphyrin pentachloride (MnTMPyP), on paraquat (PQ) -induced lung epithelial-like cell injury. 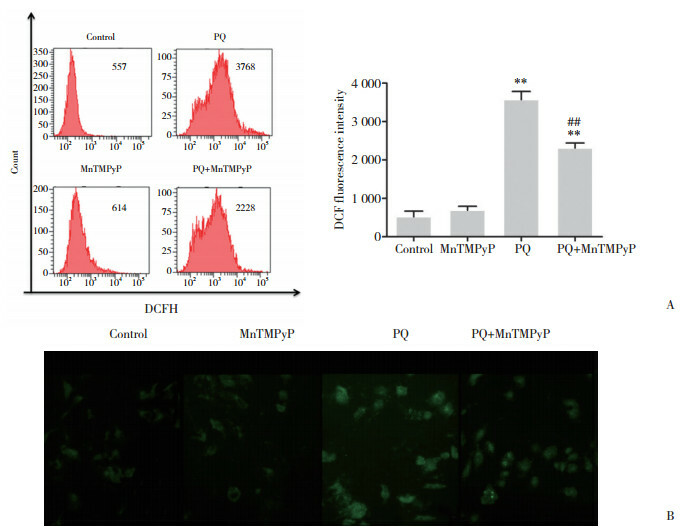 Methods alveolar epithelial-like cells (A549) were pretreated with 10 μmol/L of MnTMPyP for 1.5 h and then cultured with or without PQ (750 μmol/L) for 24 h. Cell survival was determined using the MTT assay. Reactive oxygen species (ROS) production and Ca2+ levels were measured using flow cytometry. Glutathione reductase (GR) activity was determined using spectrophotometry. Expressions of the endoplasmic reticulum (ER) stress proteins, glucose regulatory protein 78 (Grp78) and C/EBP homologous protein (CHOP), were measured using Western blotting. Results Cell viability and GR activity were decreased, but ROS production, cytoplasmic Ca2+ levels, and expressions of Grp78 and CHOP were all increased in the PQ group compared to those in the control group. There were no statistically significant changes in the MnTMPyP group. 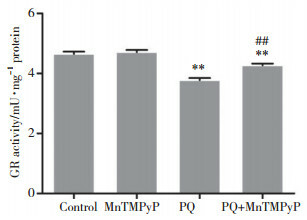 Cell viability and GR activity were increased, while ROS production, cytoplasmic Ca2+ levels, and expressions of Grp78 and CHOP were all significantly reduced in the MnTMPyP group compared to those in the PQ group. 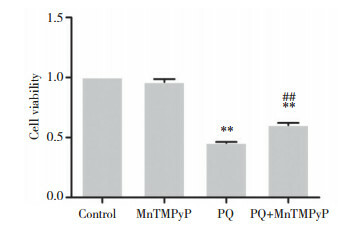 Conclusion MnTMPyP effectively reduced PQ-induced lung epithelial-like cell injury, and the underlying mechanism is related to antagonism of PQ-induced ER stress and oxidative stress. SHOKRZADEH M, SHAKI F, MOHAMMADI E, et al. Edaravone decreases paraquat toxicity in a549 cells and lung isolated mitochondria[J]. Iran J Pharm Res, 2014, 13(2): 675-681.